She never imagined the events she set in motion would take such a dramatic turn for the worse. And Ocasio-Cortez ended up suffering the biggest humiliation of her career. Alexandria Ocasio-Cortez will never back down from the idea of turning the United States into a socialist nation like Venezuela. Leftist ideologues like Ocasio-Cortez realize that so-called “climate change” is their best chance to impose socialism in America. This Trojan horse legislation calls for the ban of hamburgers, airplane travel, and fossil fuel powered cars. It also pledges to tear down and rebuild every building for “sustainability” in the United States. Finally, it proposes welfare payments to individuals who don’t want to work. Senate Democrats running for President such as Kamala Harris, Elizabeth Warren, Bernie Sanders and Corey Booker immediately endorsed the plan as a way to establish their left-wing credentials in the 2020 Democrat Presidential primary. Republicans in the Senate figured if Democrats supported this legislation so strongly, then they should have an opportunity to vote on it. That’s why Senate Majority Leader Mitch McConnell scheduled a procedural vote to advance the “Green New Deal” in the Senate. However, now that the rubber was about to meet the road, panic set in for the Democrats. Voicing their support for a 93 trillion dollar Soviet-style takeover of the United States economy was one thing. But going on the record and creating fodder for campaign commercials was quite another. That meant the crown jewel of Ocasio-Cortez’s socialist agenda did not get even one single vote from her own party. It was a massive embarrassment. But it was one Ocasio-Cortez said she engineered. “Because I encouraged them to vote present, along w/ others. McConnell tried to rush the #GreenNewDeal straight to the floor without a hearing. The real question we should be asking: Why does the Senate GOP refuse to hold any major hearings on climate change?” Ocasio-Cortez tweeted. The New York Democrat strangely claimed her issue with the vote was that Mitch McConnell did not schedule any hearings on the bill prior to the vote. 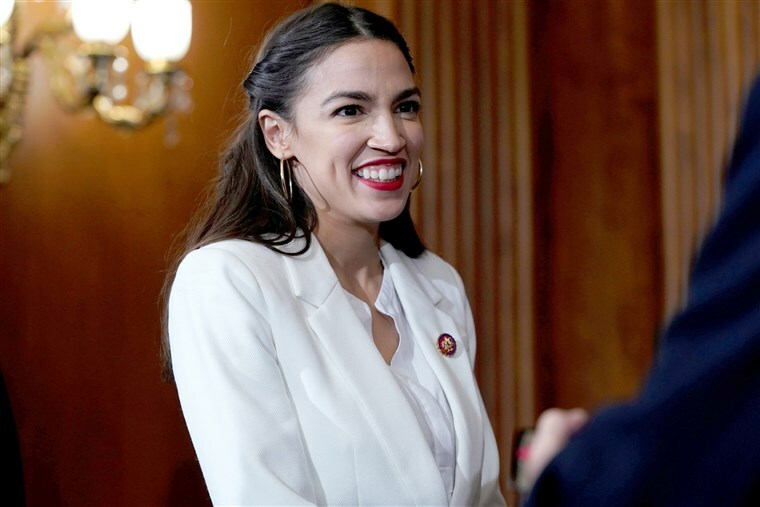 Ocasio-Cortez also fired off a tweet falsely claiming that Americans were dying from natural disasters caused by so-called “climate change”. “3,000 Americans died in Hurricane María. The Midwest is drowning as we speak. 100s of Flint families were pumped w/ poisoned water & our water infrastructure is imperiled across the country. GOP thinks this is a joke. They choose to laugh+delay. We choose to lead,” Ocasio-Cortez ranted. But none of it made any sense. So if thousands of Americans are dying on a yearly basis – and the earth only has 12 years left to exist – why would Ocasio-Cortez demand Republicans slow down the legislative gears on a proposal she claims is key to our survival? If so-called “climate change” is as urgent an issue as she claims, shouldn’t Ocasio-Cortez have been thrilled to see it rushed to the floor for a vote?